Augustus Gladstone Goes to L.A.
Hey Los Angeles! Or anyone else who can make it to L.A.! 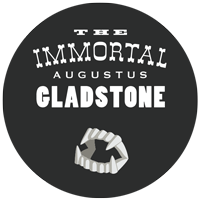 You are invited to a free and exclusive screening for my first feature film, The Immortal Augustus Gladstone. Reserve your tickets for this Saturday, February 8, 2014 from 7:30 PM to 9:30 PM (PST) at the Cinefamily Silent Movie Theatre on Fairfax in West Hollywood. From the creator of Myst comes a genre-defying tale of mystery, alienation and love in the digital age. Meet Augustus Gladstone, an eccentric who craves celebrity and connection via social networks. Augustus charms his fans with claims of immortality and a glamorous life history. But a documentary film crew prods too deeply into Augustus’ private life, raising questions about truth, identity, and friendship. There will be live music before the show and, after the screening, there will be a Q&A with Mark Frauenfelder, the founder of Boing Boing. We hope to see you there.